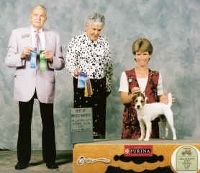 We breed, raise, train, show and sell quality AKC and UKC Parson Jack Russell Terriers for Conformation, Obedience, Agility, Earthdog, Hunting and All Around Family Companions. Best of Breed & First in Rally Obedience at Oklahoma Summer Classic Dog Show - Just One More Major to Go!! !